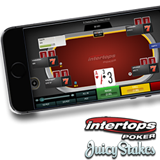 Intertops Poker and Juicy Stakes Poker have just launched a new mobile poker platform with all the same incredible features that have made the poker rooms so popular online – but optimized for on-the-go poker play. Designed for smaller smartphone and tablet screens, it has simple tap-and-swipe controls and game play at the slick new poker table is quicker than ever. No app is required – players simply log on through the browser on their Apple or Android smartphone or tablet. Intertops' and Juicy Stakes' new mobile poker rooms are faster than ever and easy to navigate. Both Intertops Poker and Juicy Stakes, the busiest online poker rooms on the Horizon Poker Network, welcome players from anywhere in the world. They're for hosting online satellite tournaments and sending winners to exotic locations for big money tournaments. This month there are daily online satellites for the European Poker Championships. The winner of the next Final (June 11th) will get a $4500 prize package and play in the €2,700 ($3,000) buy-in Main Event in Austria next month. Warm spring days are the perfect time to explore the natural beauty of South Africa. This month, Springbok Casino looks at Surf and Turf as it visits the country’s best surfing and hiking areas. The casino’s manager, Daniel van Wyk, has gathered a collection of videos of some of the best places to hike and surf South Africa. 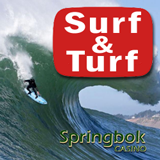 They’re available at https://www.springbokcasino.co.za/surf-turf. The video tour of South Africa begins in Durban where good wind conditions and a variety of reef, point and beach breaks welcome both novice and experienced surfers. Then it’s on to Muizenberg, on the Cape Town coast, which is considered to be the birthplace of surfing in South Africa. Another video follows the Amatola Trail, also known as the Waterfall Trail due to an unusually large number of waterfalls along the way. It’s quite a challenging hike but worth the effort for its breathtaking scenery. Table Mountain features more than 50 different hiking trails. One of the most famous, Skeleton Gorge, is somewhat strenuous but average fitness is all that is required to visit South Africa’s best-known landmark. For a look at the world’s second highest waterfall, one “turf” video takes viewers to Sentinel Peak, a popular hiking area in Northern Drakensberg. Until the end of the month, Springbok is giving free spins on its Megaquarium slot which takes players on an undersea adventure in a colourful coral reef. Available until June 30, 2017 only. Megaquarium is a tropical treat with bonus games that get better with each spin. Prizes are doubled at first but then on the very last free spin they can be up to 100X. Players can enjoy Megaquarium online on their laptop or desktop computer or on their smartphone or tablet in Springbok’s mobile casino. At Springbok, all games are played in Rands and customer service is available in either English or Afrikaans.